Win: La La Land - Drenched in romance and nostalgia | SWITCH. Winner of six Academy Awards including Best Director for writer/director Damien Chazelle, and winner of a record-breaking seven Golden Globe Awards, 'La La Land' is more than the most acclaimed movie of the year - it’s a cinematic treasure for the ages that you’ll fall in love with again and again. Emma Stone and Ryan Gosling star as Mia and Sebastian, an actress and a jazz musician pursuing their Hollywood dreams - and finding each other - in a vibrant celebration of hope, dreams, and love. The 'La La Land' competition has now closed. Winners will be announced shortly. Competition opens at 5pm AEST on Sunday 30th April 2017 and closes at 11:59pm AEST on Sunday 7th May 2017. Five winners will be chosen at random on Monday 8th May 2017. To successfully win, entrants must fulfil the above entry conditions before the time the competition closes. Current members/followers are eligible to enter the competition. Only one entry per person. Only one winner per household. To be a valid winner, the entrant must not have won a prize from SWITCH within the last 28 days. Each winner will receive one Blu-ray copy of 'La La Land'. By entering, you agree to receive occasional emails from SWITCH in the future. If you decide to unsubscribe from these updates, any further entries will not be applicable. Only Australian residents are eligible to enter. 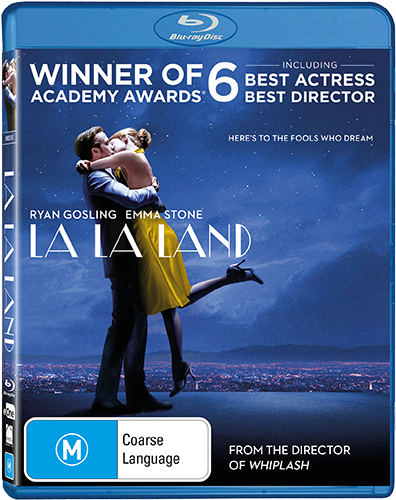 'La La Land' is available on Blu-ray, Digital HD and DVD on Wednesday the 3rd May 2017 from eOne.